2. Login to iRecord or register for a free account (only an email address is needed). 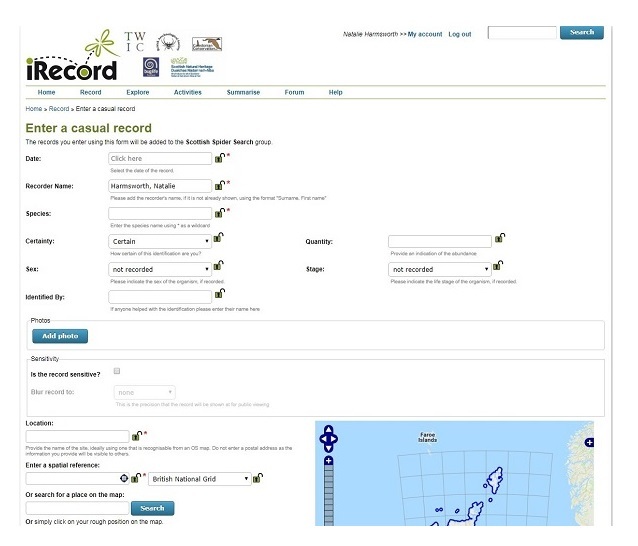 NOTE: You will need to be logged in to access the Scottish Spider Search recording page. 3. Add the Scottish Spider Search to your ‘Activities’ list by going to https://www.brc.ac.uk/irecord/join/scottish-spider-search. You are now a member of this activity and you can find it again quickly under ‘My activities’ next time you login. 4. Enter a spider record by clicking the ‘Enter a casual record’ button. Photos – upload a photo of your spider so your identification can be checked by an expert. Any other data such as habitat, number, behaviour etc. can be entered into the other boxes. NOTE: If you are entering records for Daddy Long-Legs spider, iRecord gives it the common name of Cobweb Spider! Entering a record as Daddy Long-Legs will enter a record for the harvestman. Please enter the record using the latin name of Pholcus phalangiodes or common name of Cobweb Spider! 6. Once you have entered and checked all the details, press ‘Submit’. You can view a summary of all the records submitted via iRecord for this survey by viewing the ‘Activity summary’. Thank you for contributing to the Scottish Spider Search. Your records will be shared with the British Arachnological Society, other Scottish Local Environmental Record Centres and NBN Atlas to inform research and decision-making at local and national levels. If you have any queries about inputting your records please contact Natalie Harmsworth by email or phone 01875 825968.